All around the world, heated discussions are arising about giving women an equal place to men in all spheres of society, according them the same respect and reverence. This is a welcome sign of change. Women have had to silently suffer for a long time without such dialogue. Throughout history, women have been subject to physical, emotional and intellectual exploitation and persecution. By Amma’s grace, I have been given the post of Health Coordinator for all of Amrita SeRVe’s villages and now that has included organisation of Swastha Kanya Saakshar Kanya (Healthy Girls, Educated Girls)—a movement to unite the people of our villages to give girls proper health care and education. We started with rallies in 15 villages to launch the campaign. The day of the rally was very good and we enjoyed ourselves so much as we spread awareness among the people of the village. The most important thing that I want to achieve is success for me and my family. I want to be proud for my family as well as my village. The future I want to see for all girls in our village is that they all should be given a good education so that they have no need to depend on others. They should become independent. Riya’s words are powerful and meeting her in person was even more so. In fact, she told me she wants to pursue a career as a police officer—a big hurdle for women. However, her strength is not the current experience for the majority of village women. Sita, four-years-old, is not able to speak clearly—i.e. she cannot form proper sounds with her mouth. In addition, her entire body is weak. This is likely due to the fact that she does not receive proper nourishment because her family is very poor. 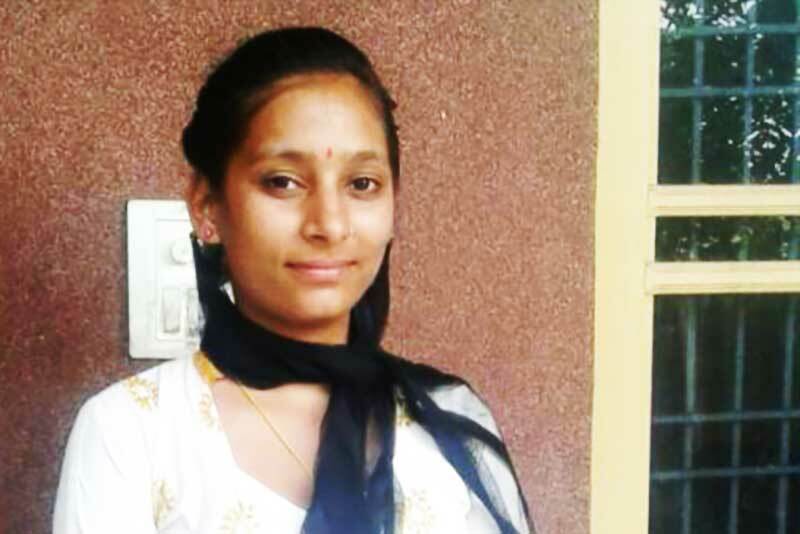 Jyoti is a young married woman who while at home, had a local teenage boy enter her house and sexually assault her. Because she had the courage to run and tell others, a group of villagers caught the boy and disciplined him. However, all too often when it comes to sexual offences, the stories are shoved into the background and offenders are not properly punished. Instead, the shame is meted out upon the shoulders of the women and girls. Pushpa refuses to go to school. She will only do housework or work out in the fields. But after the Swastha Kanya Saakshar Kanya rally in her village, her family wants her to begin a proper education. They want her to have the opportunity to lead a better life as a woman with a successful career. To this day, village girls are not encouraged—sometimes not allowed—to complete their educations. In fact, 46% of rural women are literate compared to 71% of men (2011 India Census Data). Even more critically, in terms of their health and nourishment, girls are given the least preference. Fifty-six percent of adolescent girls suffer from anaemia (UNICEF). As a result, village girls grow up to be unhealthy mothers and uneducated wives who are unaware about their rights. They are also unaccustomed to properly taking care of their own and their family’s health. The result is that this same vicious cycle is repeated again and again throughout the generations. 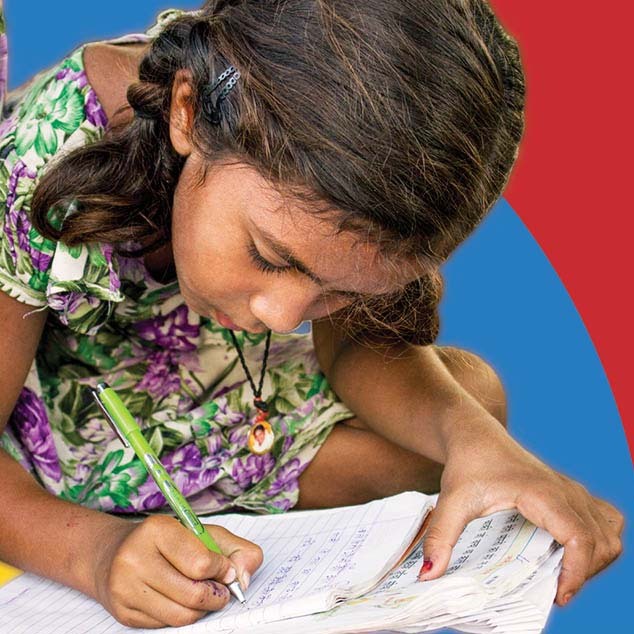 Swastha Kanya Saakshar Kanya launched at the end of April and is in support of the Beti Bachao Beti Padhao Campaign (Save the Girl, Educate the Girl) of the Government of India. Starting with the rally days made a huge impact. 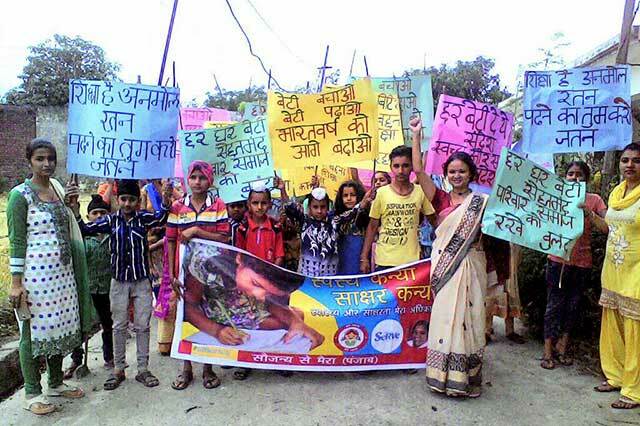 Women, men and children participated with full strength, proclaiming loud slogans for educating the girl child and taking care of her health. I was at the rally in Maira, Punjab and thought maybe 20 people would come, but it turned out to be more than 100 participants. There was an unforgettable glow on all faces, and as they spread their smiles, the rally crowd kept growing with people coming out of their houses to join in. Some of the women even had tears in their eyes. Having faced these problems with health and education in their childhoods, they do not want their girls to have to do the same. In all locations, village heads and school principals made sure to take part along with local nurses, auxiliary nurse midwives (ANMs), and accredited social health activists (ASHAs). All in all, more than 1,500 people participated across the country in this revolutionary march. Many states also got local media coverage for the rally with newspapers like Dainik Bhaskar, Dainik Jagran, and Punjab Kesari covering the event. A rally, though, is only one day. Many more things need to occur to achieve our goals. To begin with for the Swastha Kanya Saakshar Kanya Campaign, we gave school children the opportunity to pledge their commitment. 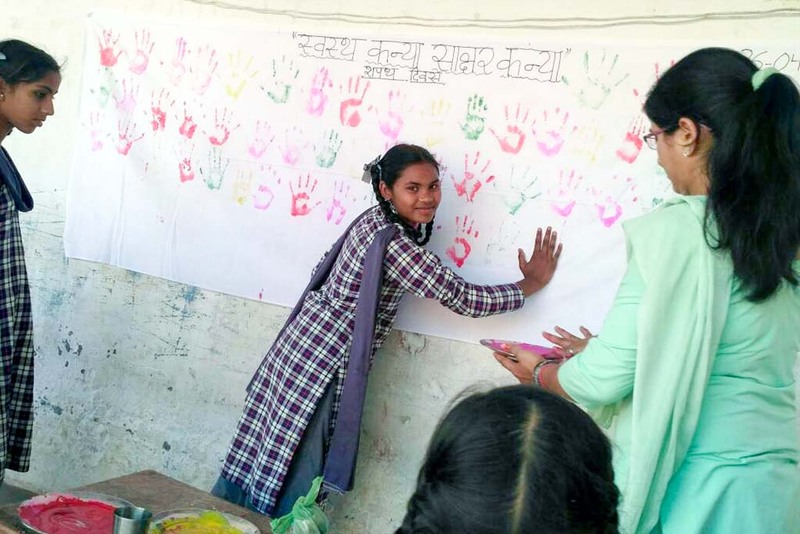 In every village, they placed their handprints upon cloth banners to promise they will do their best to bring health and education to all girls. We are also telling the children stories about women who have made huge imprints in terms of breaking the barriers women face. Take, for example, the story of Sampat Pal from the impoverished Bundelkhand region of Uttar and Madhya Pradesh. She is the chief of the Gulabi Gang that now has more than four lakh members in UP, MP and Bihar. Pal was married at the age of 12 to a resident of the Banda district in UP. At age 16, she opposed a neighbour beating up his wife regularly and decided to show him his place when he threatened her for speaking up for his wife. Pal then motivated women in the area to teach the man a lesson. They thrashed him and let him go only after he apologised in public. She soon came in touch with social activist Jai Prakash Shivharey who motivated her to fight for women’s rights and launch the Gulabi Gang in 2006. 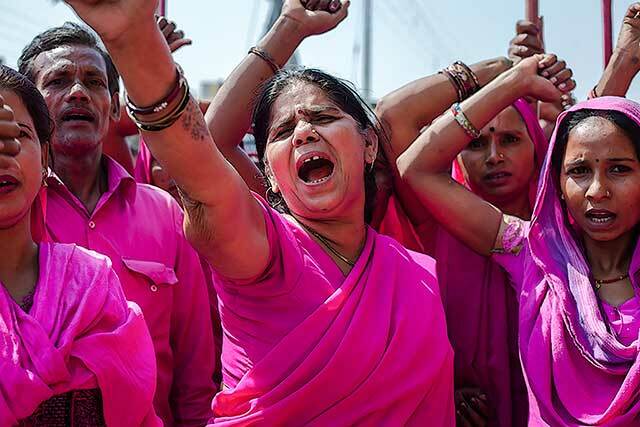 The women wear uniform pink saris symbolising strength and carry around bamboo sticks that can be used as weapons, if needed. “We are not a gang in the usual sense of the term,” says Sampat. “We are a gang for justice.” The members of the gang face male offenders and prevail upon them to see reason. The more serious offenders are publicly shamed when they refuse to listen or relent. Sometimes the women use their lathis if the men resort to use of force. Inspired by this story of empowerment, a group of women in Indpur, the Amrita SeRVe village in Himachal Pradesh, has joined together to do the same. They say their mission is to defend women when they are mistreated, especially when it comes to violence and sexual harassment or assault. So far, the group has 40 members. In terms of education, we have started a program for school attendance. 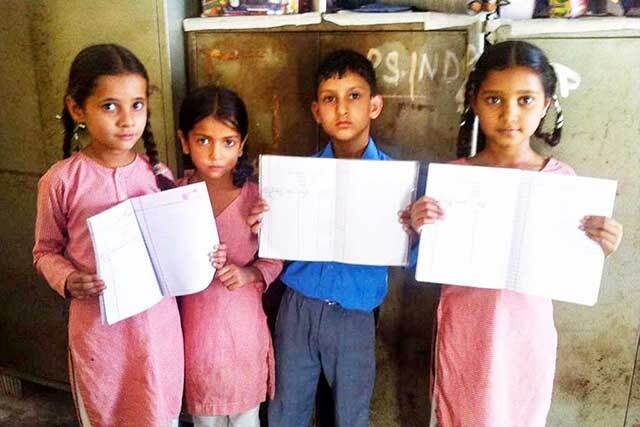 Monitors known as “Bade Bhai” (elder brother) and “Badi Bhen” (elder sister) are appointed in village school classes. Their job is to let the teachers know when a student is absent for three days consecutively. Children often miss school for reasons beyond illness. They are needed to work in the fields or do the household chores while their family members go out to work. However, sometimes when they are fully informed, parents decide that it is more valuable to invest time in their children’s educations, as it will bring a better future for the entire family. Of course, the building of secure wellness for all continues in our villages with the Amrita SeRVe Health Workers who gather information from families about their health histories and needs. Their work includes things like checking blood pressure, sugar levels, and haemoglobin on a regular basis, with an emphasis on children and pregnant women. They also help villagers arrange ways to see the doctor when it is necessary, as in many villages, the nearest one is hours away. 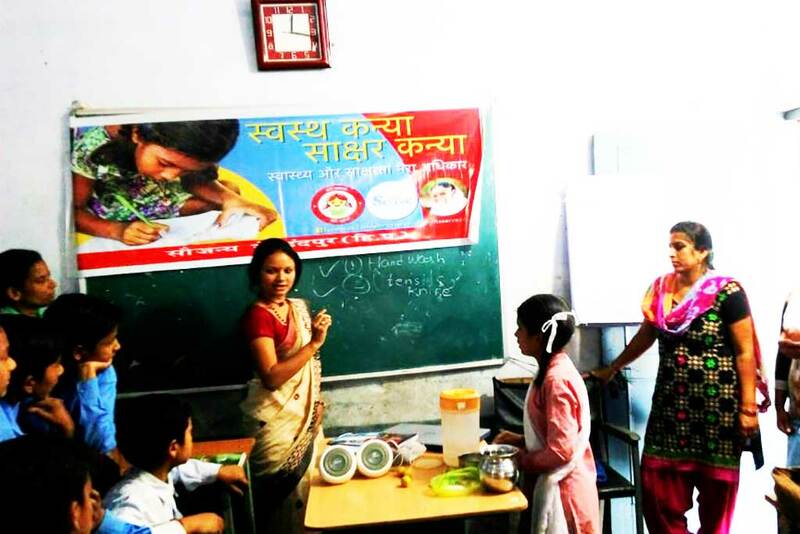 We are also beginning a series of health awareness sessions in schools and with our self help groups. 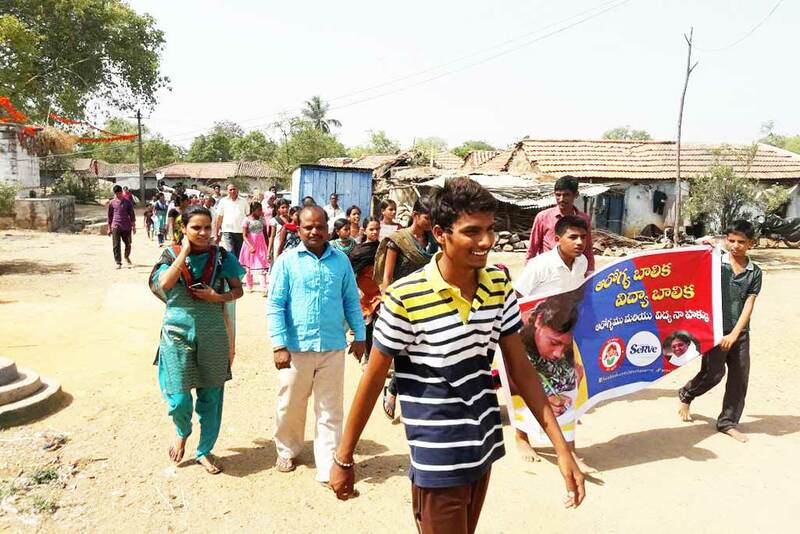 For example, the one we held with teenagers in the government school in Indpur had more than seventy students and addressed the topics of hygiene and sanitation, diarrhoea, making of oral rehydration salts, tobacco use and smoking prevention. As you can surely see, Swastha Kanya Saakshar Kanya is the start of a long journey, and there are no easy answers nor quick and flashy results. Having taken up the challenge, we are ready to continue serious groundwork over the next few years. The significant changes needed in the mindset and living conditions for women in all of India’s villages have begun. We will continue to move forward with these along with many more yet to come. Why? Because enabling India’s women will empower the entire country on all levels–physically, mentally and spiritually.